Students learn leadership and management skills to complement their sport development and athletic career development pathway. The course is designed to challenge the participants in their understanding of sports and athletic development, coaching and business knowledge. It provides a solid base for future employment in the sports business sector and leadership positions. The program includes a blended mode of self-paced learning, project-based learning and application, and face-to-face training. Learning is grouped into four thematic areas - Managing athlete performance, Managing the business, Coaching the team, and Becoming a leader. Delivery of units is staggered over one year of full-time study with individual support sessions scheduled each month. The individual support sessions are approximately three to four hours in length and include a combination of training, support and assessment. In addition to the individual support sessions, students are required to attend three days of classes per week: these classes provide intensive, face-to-face learning designed to provide support for students around the complex nature of Diploma-level studies. Students also participate in high-performance practical sessions over the course of their learning. Another element of this delivery is a compulsory work placement of 150 hours that must be completed in a sports context over the term of this course. 50 hours of the 150 hours’ compulsory work placement must be undertaken in a coaching context. Ideally, students will coach a junior sports team at their local sporting club. Trainers and assessors will visit the students on placement to support their real-life learning and industry experience. Students will be inducted into the RFC as a staff or volunteer member and undertake supervised activities in developing the RFC’s community awareness program. The Richmond Institute of Sports Leadership, in partnership with Swinburne and Richmond Football Club, offers a unique pathway aimed at developing the next generation of leaders within the sports industry. 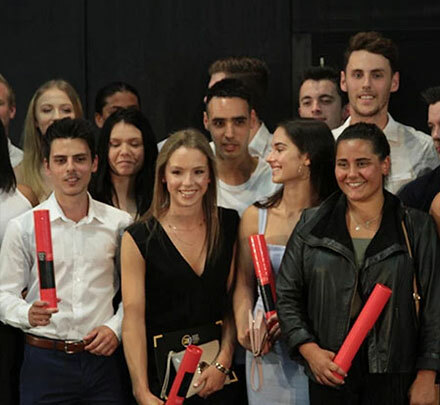 We’re proud to see the first cohort of Swinburne and Richmond Football Club’s Sports Leadership and Management course successfully graduate. Many of the recent grads have already gained employment at either the club or its subsidiary businesses – with others receiving the opportunity to continue their studies at Swinburne with a guaranteed degree placement. This course is offered as a dual diploma only with no separate exit points. Students must complete all units of study. The Diploma of Sport Development / Diploma of Leadership and Management prepares graduates for a career in sports leadership. Graduates will develop skills and knowledge in sports development, athletic development, leadership and business, coaching and training to prepare them for employment or to continue study into an approved Bachelor course. Students learn high performance training and nutrition skills, personal organisation skills, coaching and leadership skills, and business skills including budgeting, project management, people management, safety and compliance. This course provides graduates with the skills to work in the sport development sector and reflects the role of individuals who apply knowledge, practical skills and experience in leadership and management across a range of enterprise and industry contexts. Occupational outcomes for this qualification can vary from managing competitions, sports venues and facilities and identifying and developing athletes. Work at this level would be undertaken with a high degree of autonomy. The following are indicative job roles for this qualification: Competition manager, Program developer, Talent development manager, Sport development manager, Leisure and recreational facility co-ordinator, Leisure and recreational facility program development, Sport and recreation community development officer, Sport and recreation administration, Sport and recreation event management, Sport and recreation consumer business officer. Indicative nominal course hours: 625. Indicative nominal course hours: 582. Step 1: Register your details and nominate which open day/information session you would like to attend at Richmond FC. Step 2: All applicants are interviewed as part of open day/information session proceedings.